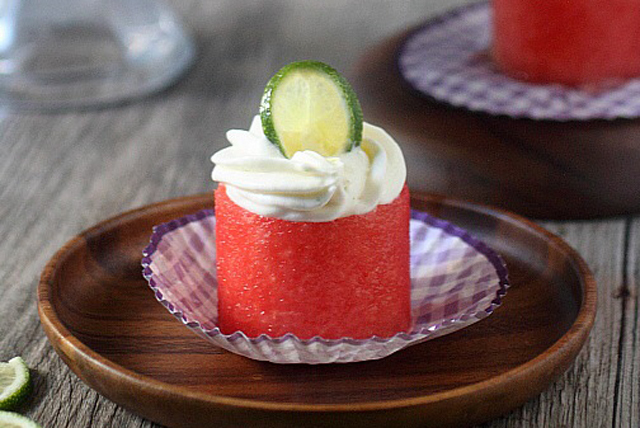 These Watermelon Lime Cheesecake Bites are what happen when refreshing and citrusy join forces with smooth and creamy! To a bowl of an electric mixer fitted with a whisk attachment (hand mixer works here as well), add cream cheese, lime zest, lime juice, and vanilla extract. Whisk on medium/high speed until combined. Turn off the mixer and add the powdered sugar. Whisk on the lowest speed until sugar is fully incorporated into the cream cheese mixture. Increase the speed to medium/high and mix until fluffy, about 40 seconds. Add the heavy cream in 3 parts, allowing the heavy cream to thicken after each addition before adding more heavy cream. Mix until thickened, about 30 seconds. Transfer the lime cheesecake to a large piping bag fitted with a round or star tip and place in the freezer while you prepare the watermelon rounds. Cut the watermelon into disks about 2 inches thick. Using a 2 inch round cookie or biscuit cutter, cut about 5-6 cylinders out of each watermelon disk. Remove any seeds (seedless watermelons aren’t exactly seedless) with tweezers. With a small cookie scoop (or the small end of a melon baller), hollow out the center of each watermelon round a bit, but not all the way through. Place the watermelon rounds (hollow side down) onto paper towels to drain any excess watermelon juice, about 15 minutes. Remove piping bag containing lime cheesecake from the freezer. Pipe the lime cheesecake filling inside each watermelon indentation until you reach the very top. Garnish with lime slices and serve immediately. Watermelon can be cut into 1 inch rounds for a smaller bite and a higher yield. No need to double the lime cheesecake filling. Lime cheesecake filling can be made 1 day ahead of time. Spoon filling into a large sealed container and place in the refrigerator instead of the freezer until ready to use. If separation occurs, mix with a small whisk or a fork to reconstitute. Place filling in a piping bag with round or star tip and proceed with the recipe.